Blurb: John and Jack are mystified when they discover a cryptic warning on a medieval manuscript—a warning that is not only addressed to them, but seems to have been written by their friend, Hugo Dyson. But before they can discover the origins of the book, Hugo walks through a door in time—and vanishes into the past. In that moment, the world begins to change. Now, the Archipelago of Dreams and our world both suffer under the reign of the cruel and terrible Winter King. Dark beasts roam the countryside, and terror rules the land. John and Jack must travel back in time—from the Bronze Age to the library in ancient Alexandria to the founding of the Silver Throne—to find the only thing that can save their friend and restore both words. The solution lies in the answer to a 2,000-year-old mystery: Who is the Cartographer? So, I may or may not have continued reading after my dinner break last night and ended up reading for the next couple of hours and then only had, eh, two chapters left to finish up this morning? Friends, I remember this series being good. I didn’t remember it being this good. But, let’s focus on the third book, shall we? 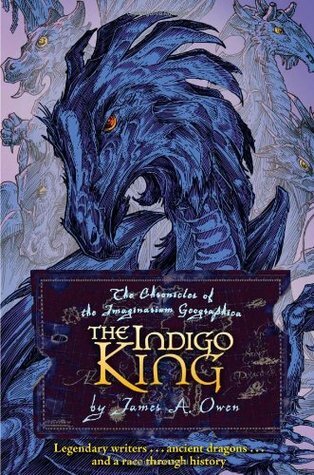 I really enjoyed The Indigo King, mainly because it had a complete shift in tone that I wasn’t expecting. It was much darker than the previous two installments. Pair that with the always complex and oftentimes complicated aspects of time travel (when I asked my boyfriend to help me wrap my mind around what was going on, as soon as I mentioned time travel, he immediately said, “Oh no, we don’t even try and touch that,” so you see what I mean) and this book felt a lot different, while still encompassing the elements that have become so integral to this series; namely, the characters and their personalities, the narration and the way it is written, the fantastic moments of humor and then way literature ties so effortlessly and cleverly into this plot. Although, I will have to mention: Charles not going on the adventure with John and Jack was a surprise (because my memory is shite, apparently) and one that worried me, especially at the beginning, because Charles, well, I’m actually rather fond of him. Yet, as the story progressed, of course that had to happen and I think I love Charles all the more for it, now. My favorite aspect, once again, was the badgers, this time, with Uncas and Fred and their copy of The Little Whatsit, which honestly, I wouldn’t mind owning myself. Their antics, personalities, mistakes, honesty and animal logic add such a wonderful element into the story and I feel they are some of the most integral characters within the narrative. I wish I could eat some crackers and have tea with them (though definitely not after it has rained). I won’t lie: the time travel was a bit confusing for me and made my head hurt slightly, but it’s time travel. That’s a concept that’s always super intricate and hard to pull off. I do think Owens has pulled it off here–which is a good thing, because I don’t think we’re done with the concept at all, within the rest of the series. Nay, I believe we’re just getting started. Yet even though I wasn’t 100% clear on how it worked the entire time, I was fascinated everything they had to do in order to fix their mistake (and I somehow completely forgot who the Cartographer was and have thus been floored once again). I also loved how seeped into Arthurian lore we got into this book and the inclusion of Geoffrey of Monmouth!? Oh, my medievalist heart was all aflutter. Obviously, I’m falling in love with this series over again, as I’m flying through these books. Only two more to read until I read the last two for the very first time. If I keep accidentally reading past my dinner break, that may be much sooner than I realized… (especially with all those teasers Owens leaves at the end of the book, how can you not force yourself to keep going!?). Nevertheless, I’m excited and I think I will always be in complete and total awe of this series–and a little jealous that it’s not real.